Michael Muller's "Into the Now" put me up close with sea creatures that terrify me. The first time I realized I was terrified of whales, I was surprised. I had been scrolling through Instagram and saw a picture of a boat adrift in the ocean with the gigantic shadow of a whale below it. The hairs on the back of my neck stood, and I was overcome with an unshakable sense of foreboding. Those animals are massive, and I know they're generally gentle (orcas aside), but the thought of such a large swimming creature gave (and still gives) me the heebie jeebies. Considering I also get creeped out by schools of fish, my whale phobia isn't actually too shocking. Many fears are irrational, and trying to overcome them is no easy feat. 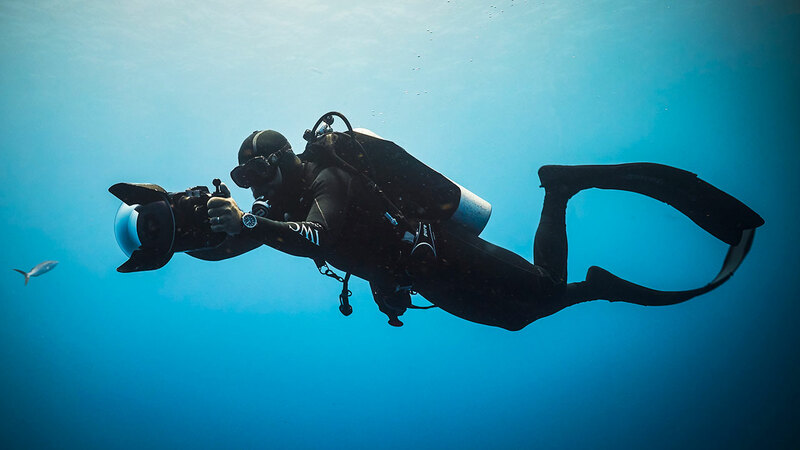 Photographer Michael Muller confronted his own deep fear of sharks by "learning to dive without protection and cage-free with great white sharks," ultimately documenting that journey in his new VR film series Into the Now. Premiering at Tribeca Film Festival's VR Arcade this year, Into the Now is an exploration of a wide range of issues and was produced by Ridley Scott's RSA VR studio. From how virtual reality can help stress disorders like PTSD and anxiety, to climate change and overfishing, the first episode was a meandering ride that covered myriad topics. It could do with more focus and a coherent plot or message. Muller expects to have 10 to 15 installments of Into the Now, and having each episode look closer at one part of the conversation, whether it's climate change or treating phobias, could prevent the material from becoming overwhelming. During my preview, I was seated in a Positron Voyager virtual reality chair, which I can best describe as a swivel chair that turns around for you. It not only ensured I didn't have to keep turning my head around to focus on where the action was happening, but gave me a floating sensation that made the underwater experience seem more real. I felt like I was in a submarine looking out of borderless windows. In fact, I was so caught up that at one point I whipped out my phone to take a selfie with the virtual school of fish, only to remember I wasn't actually there. Without the chair, you'll likely still find Into the Now enchanting. It's incredibly realistic, thanks to the high quality footage that Muller and his team captured with 9 large format cameras in 4K Stereoscopic 3D. I watched, fascinated and petrified, as they got up close with sharks, whales, stingrays and other underwater organisms. If you share my fears, you may not want to subject yourself to this -- I was squirming in the chair for many parts of it because there were massive whales swimming barely a foot away from me. But those who don't mind or love these creatures will really enjoy the experience. Entertainment and educational value of Into the Now aside, I'm most intrigued by the potential it (and similar VR experiences) could bring in treating phobias and stress-related conditions. Muller and his team are partnering with Stanford University's Neurology department as part of an ongoing research project on the benefits of VR for people with PTSD, anxiety and other stress disorders. Meanwhile, Muller is looking for distribution for the series, which will next air at the Cannes Film Festival. If you'll be there or are here in New York for Tribeca, check it out. Into the Now is a captivating ride that'll take you briefly to a world you'd rarely get to see otherwise.